Chance is for the kids. 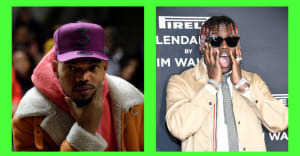 When his New Era collab 'Chance 3' hats dropped earlier this month, Chance the Rapper tweeted that the timing was strategic, so fans could be him for Halloween. Naturally, those fans obliged, and '3' hat/overall combos have been in abundance across social media all day. Today, Chance has been doing some selective retweeting of those fan costumes, but with an unexpected emphasis on the tiniest members of his fan base. Apparently, a lot of parents had the same idea, and outfitted their babies as miniature versions of Chance. Below is a quick highlight reel, because this seems important.